The sovereign nation of Econopolis, the world's largest absolute moneyarchy. ECONOPOLIS—As part of an effort to consolidate ties with the sovereign fiscal nation, U.S. Federal Reserve chairman Ben Bernanke visited the cloud city-state of Econopolis on Friday to participate in ongoing diplomatic talks. Bernanke, who traveled in a luxury cable car to the opulent capital floating 20,000 feet above the earth's surface, was greeted upon arrival by President Cash Moneyton III, as well as a delegation of Econopolis representatives from the Ministry of Supply, the Bureau of Demand, the Agency of Goods, the Department of Services, and the Office of Consumption. "Econopolis is the world leader in the exchange of currency and a shining beacon of commerce," said Bernanke, admiring the hundreds of glass skyscrapers and the 125-story golden dollar-sign-shaped tower that dominate the skyline of the Ka-Ching financial district. "This great monetary nation is a key strategic partner for the United States and crucial to its fiscal well-being." "America treasures this relationship and greatly benefits from its alliance with the world's No. 1 supplier of commodity, value, and profit," Bernanke added. The Fed chief meeting with President Cash Moneyton III. In honor of the Fed chief's historic visit, President Moneyton III hosted an extravagant 11-course feast that featured local delicacies such as succulent sous-vide stock certificates; aged ticker tape served with fiddlehead ferns, ramps, and morels; safety deposit boxes filled with silver gravy; dumplings stuffed with braised shredded cash; countless savory and sweet pie charts; and an upside-down treasury bond cake. "All of the banknotes are grown locally," said Moneyton III, dipping a number nine into a fresh euro salsa and biting its stem. "You must try the legal tenderloin. It just melts in your mouth. And those freshly minted coins are simply divine." 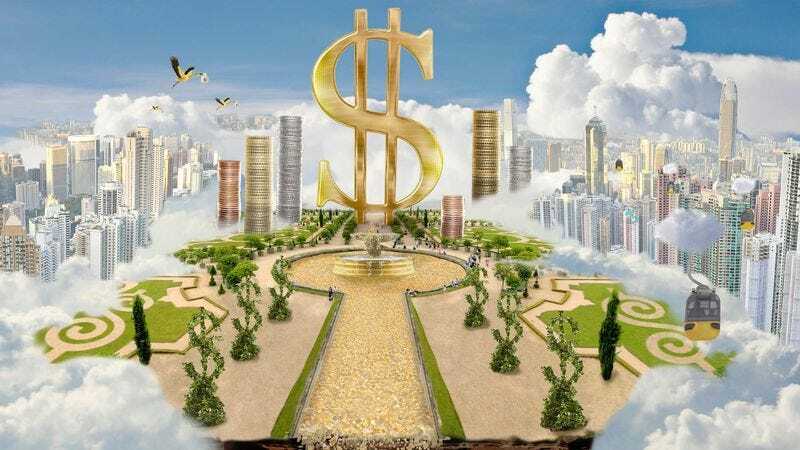 Econopolis, which gained independence in 1953, is an absolute moneyarchy first established in 1865, shortly after prospectors discovered the hovering territory was rich in cash deposits. Today, the country is the world's chief manufacturer of numbers, funds, and markets. During his visit, Bernanke was reportedly invited on an assembly-plant tour, where he saw workers weld together gleaming new number 44s with high-powered torches. In another part of the factory, the Fed chief encountered a scaffolding-covered number 1,234,987, which was surrounded by massive cranes equipped with large shovels to dump more digits into the partially built numeral. The tour of the cloud nation's industrial sector concluded with Bernanke accompanying local wealth inspectors as they evaluated a mill tasked with producing assets and manufacturing vast amounts of value. Sources confirmed Bernanke was also invited to the grand opening of the National Budgetarium, which houses a wide variety of fiscal flora and fauna, including more than 90 different species of decimal points, large lumbering equations, and flowering financial plans with gorgeous estimated-expenditure blossoms. "Econopolis is filled with so many marvels, from the glittering canals flowing with liquid diamonds to the quaint financial market where locals sell the most elegant handcrafted rates," Bernanke said. "I even caught a glimpse of the last herd of wild accountants grazing on a patch of receipts." Pledging solidarity with Econopolis, Bernanke paid tribute at the Vault of the Unknown Banker by laying a wreath woven from $100,000 in U.S. currency and containing bills of every denomination. "This is an astonishing and fitting monument to all those who have anonymously served, invested, and transacted for the greater goods," said Bernanke, wiping away tears while examining the memorial's columns, marble-carved renderings of rolled coins. "It's just so very touching." At press time, Bernanke announced that due to several conflicts he was forced to change his travel itinerary and cancel a stopover in the nation of Downturnijan.